Classic Industries offers a wide selection of Dash Components for your Chevrolet Bel Air. Classic Industries offers Chevrolet Bel Air Cigarette Lighters & Parts, Chevrolet Bel Air Rochester Cigarette Lighter, Chevrolet Bel Air Casco Cigarette Lighter, Chevrolet Bel Air Rochester Cigarette Lighter Heating Element, Chevrolet Bel Air Casco Cigarette Lighter Heating Element, Chevrolet Bel Air Rochester Cigarette Housing Retainer, Chevrolet Bel Air Casco Cigarette Housing Retainer, Chevrolet Bel Air Cigarette Lighter Harness, and Chevrolet Bel Air Cigarette Lighter Assembly. 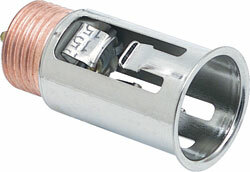 Replace your missing or non-working cigarette lighter assembly with this exact reproduction. Features a fused pigtail which plugs into your original wiring harness.